A lot of champion athletes will tell you that it can be harder to defend a championship than it is to get to the top in the first place. Not having enjoyed that level of success in athletics (or anything even close! ), I can’t really relate. But this year, my buddy Milford and I were entering our local fishing derby as defending champs. Now that may be a reach; they don’t really have an award for best fisherman, but they do give out prizes for catching a tagged fish, and we had caught a prize-winning fish two years in a row. Not only that, but the year they released really giant trout, I had landed a limit of five fish that tipped the scales at better than 22 pounds! They still use our photo for their website. So at least in our opinion, we were defending the crown. The day dawned surprisingly clear, a nice break from our nonstop rain. I checked in to the booth that the Astoria High School fisheries program had set up on the banks of Coffinbury Lake to register anglers. I joked with the director of the program, Lee Cain, that we were going for the gold, and he gave me every encouragement. (Or at any rate was happy to get our entry fee!) Lee is a great guy and his students get a ton of practical experience, raising fish, and doing projects all around our region’s bays, lakes and streams. The money they make is very well spent. I got our entry slips and hustled down to the dock to help Milford back in the boat. 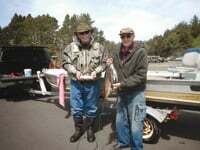 My buddy and I have fished together for decades. He’s on the far side of eighty now, but despite a couple of fake knees and shoulders, he’s always up for a trip. The boat was set up and ready when I got to his place and, as usual, he did most of the work. Over the years, Milford has never really mastered the art of backing in a boat. In fairness, this little skiff rides pretty low and is tough to see from the driver’s seat, but on this day, he was really having a problem. First try, he poked the stern into a grove of alders growing beside the ramp. Then he jackknifed it into the side of the dock. Finally, I got close to the window and helped him get it in line. By the time we got it into the water, folks on the dock had figured out that we were senile old birds who needed a bunch of help. It would be 15 minutes before the derby would officially start, so they gave us their full attention. A couple of them held the boat to the dock, while one took the line to keep it steady. After Milford parked the truck, they helped him get into the boat and gave me a hand as well. I felt like I had a “HANDICAPPED” sticker on my head! We got the boat launched and motored it out in front of the docks. We were in everyone’s way, blocking their casting lanes, but we still had ten minutes before starting. I had already set up my fishing rods. We had learned that the best way to fish the lake was to use “wedding ring” type spinners. They were light, spun on the surface above the weeds that filled the lake, and had room for half a worm on the hook. They proved deadly for newly planted fish. Milford, however, even though he’d gotten together everything in the boat, had forgotten to rig his rods in advance. I cringed when I saw him reaching for the packet with the new spinner inside. My buddy has always been the slowest rigger I’ve ever seen. It takes him forever to get gear set up and ready. That is no problem at all on streamside where we can go our own way. But in a boat, that means I have to sit and wait, sometimes for quite a while! That too isn’t much of a problem, but on this day, we were right in the middle of everyone’s action. I suggested we might motor out to open water; my partner wouldn’t think of it! “Most of the big trophy fish are here near the dock, and it will only take me a minute or two to get the rod ready,” he responded. We only had ten minutes till “cast off” time. I hoped he was right. It seemed to take forever for him to fish the lure out of its plastic bag. Then he had to figure out how to undo the “twistem” that held the leader neatly in tight loops. That wasn’t easy to do; I’d had a bit of trouble with it myself. It took Milford about five minutes. Then he had to trim off the extra leader. Finally with only a minute to go, he tried to tie the leader to the swivel. I looked over to the docks and saw people loading up their hooks with power bait, worms and other condiments, and looking for a clear place to cast. When I looked back to my buddy, I saw his hands trying to tie a knot, but there was no leader to be seen. It had slipped out of his fingers and dropped through his tackle box. All the spinner blades and little beads were rolling around the bottom of the boat! I could hear what sounded like hail as the bait and sinkers started landing all around us! I put on our worms as Milford started up the electric motor and wove our way through the docks. By the time we had cleared the last caster, we were in the water trolling. And catching fish! It only took about 20 feet of trolling and Milford had his first fish, a 10-inch planter! As I netted it, I asked him if he wanted to keep it. Like me, Milford is a great fish eater, so the question might not seem necessary, but if we were going to be catching really big trout, maybe we didn’t want to fill his five-fish limit on these little fish. “Keep that one,” demanded my buddy. “You never know if we’ll get many or not.” That made sense—on a lot of days one fish is all we catch. In the next five minutes, the situation started to clarify. Milford had hooked and landed five fish. So we put another on the stringer, and left room for something bigger. We didn’t have long to wait. Milford set the hook on a fish that cruised over next to me. I could see the bright red color of the big fish that the fisheries folks had tagged. “Shut down the motor, Milford, we don’t want to lose this one.” He guided the fish toward me and I scooped it up with the net. It was a long jawed beauty of some 20 inches; we could see the little green tag stuck in its side! Once again, we were in the money! That was hardly, however, the end our action. Over the next four hours we caught and released well over a hundred fish. Sometimes we’d get into a school that would give us 10 hookups in less than 50 feet of trolling! All were in the 10- to 12-inch range, and some provided a lot of fight for their size. The sky overhead was full of eagles, osprey and gulls looking for fish that were cruising on the surface. They seemed to be having a pretty good day as well. Unlike the birds, however, we were running out of bait. I’d loaded up on some fifty worms, and we’d divided them into thirds for the hook, but all the action had gobbled up the whole mess. We decided to call it a day, and headed back to the docks. As we pulled up to the dock, Lee came out to greet us, and the other fishermen on the dock put down their rods and helped us get to the safety of the dry boards. More help for the old men! I had to admit my legs seemed pretty dead after being cramped into the little boat for the long morning, so I was glad to get a lift up onto the platform. Folks watched Milford’s creative trailer backing for a while and then finally just went out and picked the light rig up and moved it so all that he had to do was get the truck close! The derby had gone well for everyone, but we still offered an impressive looking bag with our limit of trout topped off by the big trophy fish! Milford went and collected his prize (some canned fish, naturally), pictures were taken and we drove off in triumph! Another big day on the lake, another prize-winning effort! Can’t wait for next year, maybe we can get someone to back up the truck for us. I’ll be sure and help Milford rig up before we get on the water, and we better take at least a hundred worms!